Karen and I went to a dinner party Friday night, where we played a game–it was some sort of variant of Twenty Questions. It was introduced to us by our friends Andy and Ruth, who are a mathematician and an astronomer, respectively, so you know it had to be a little more complicated than that. Explaining the game would take a while, so suffice to say part of it was that you had to choose a person and then say what their last name started with. When it came to my turn, I racked my brain for a good celebrity. We’d had Indian food for dinner, so while looking at the table I came up with Tim Curry. I figured the game would be over fairly quickly–Karen and other people who knew me well were in attendance–but my round took the longest by far. * It got to the point where they knew my person was male, an actor, British, appeared in comedies, and had something to do with a Stephen King movie. What amazed me was how many British actors with a last name starting with “C” they got through before Karen finally got Tim Curry: Sean Connery, Michael Caine, and Daniel Craig. 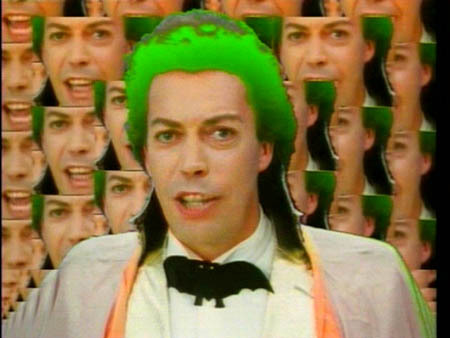 But ultimately I just felt a little sad for Tim Curry, who’s apparently more obscure than I realized, despite his memorable performances in Rocky Horror Picture Show, Clue, IT, Legend, and of course his tour-de-force in The Worst Witch. Here’s something that’s been bugging me lately. One issue that concerns me is man-made climate change. I have my own thoughts on its existence, but I’m not here to debate that right now. Rather, what I’m curious about is why, exactly, those who aren’t convinced man-made climate change is happening are so goddamned ginned up about it? I can read any article about global warming on any news website and be assured, without even looking, that there will be swarms of the MMCC-unconvinced going on and on in the comments, to the point where it soon crosses the “protests to much, methinks” line. The only equivalent hot button issue I can think of is abortion (the current astroturfed health care stuff aside). Now, I get where the vehemence comes from on abortion. The passion on both sides makes sense to me. But in my experience on the climate change issue, I’ve seen a lot more vehemence from those who refute man-made climate change than those who are convinced it’s happening. 1.) More space. Karen and I have been in this two-bedroom apartment for almost four years, and our stuff is stacked to the ceiling now. 2.) Having a yard. On a nice day, my options are staying inside or going for a walk into downtown Brighton. Or driving somewhere nice. I’d love to be able just to go out and sit on a porch or a deck and read. 3.) Getting a dog. No dogs allowed in our apartment. 4.) Packages will actually be delivered, rather than slips being left in our tiny mailbox forcing me to try and fit in a trip to the post office in that single hour before or after work when the PO is open. I don’t know how many times I’ve gotten home around 4:30 (I work 8am-4pm), grabbed the package slip and ran down to the post office only to learn that the carrier hadn’t even brought the package back yet (and of course the post office closes at 5). And don’t even get me started on UPS or Fedex. I had to drive 45 minutes last month to pick up a Fedex package in Wilmington. 5.) Having a washer and dryer that don’t cost $4 per load. After four years, we’ve paid about $2,000 in weekly laundry. Contrary to popular belief, hell is not a landscape of red rock with flames flickering here and there, nor is it other people. If, as some theologians conjecture, hell is the worst thing any particular individual can imagine, I’m fairly sure that June 2009 in New England is my own personal hell. If you receive no more missives from me, it’s likely because I went insane from lack of vitamin D.
On Saturday, Karen and I went to see my good cousin Ed (of the Ed Zone) in his first dramatic appearance since the renowned Rockland High production of Annie nigh on twenty years ago. 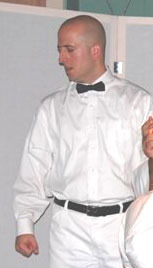 This time he played asylum orderly “Aide Warren” in the Gateway Players’ production of One Flew Over the Cuckoo’s Nest. Ed seemed natural in the role of the sadistic, brutal Warren, which makes me wonder what life is like for the employees he manages at his job, but whatever. Dressed smartly in a white shirt with a black bow tie and sporting his clean-shaven head, Ed’s Warren looked like a 1950s gas station attendant–from hell. There’s still another weekend of performances to go, but tickets are sold out, so if you don’t already have one, you’re out of luck. But if you’re going, prepare to enjoy an enlightening evening watching one of the classics of American drama–or a bald guy gleefully beating on mental patients, if that’s your thing. I’ve participated in online communities ever since the days of Prodigy’s bulletin boards back in the early 1990s. I still remember my first–and only–flame war: it was with a guy named Den Elms over how realistic the effects in Jurassic Park looked. I also remember another poster chiding me for the anti-Elms posts I was writing, saying I didn’t need to “build a temple of hate” to the guy. I took that criticism to heart,* and ever since I have stayed away from flame wars and arguing on the Internet–which is, of course, the best modern analogue for the myth of Sisyphus. The so-called Shindig–the East Coast reception for those who couldn’t make the West Coast wedding–went off last weekend without a hitch, since my wife and I had already gotten hitched in early August. The wedding itself deserves its own post, as does, well, pretty much every non-toy-related thing I’ve been doing since I last posted here regularly, but PGPoA is still taking up most of my blogging time and energy. We’ll see if I can up the post count here in the near future. Man…drear, drear and more drear. Rain or snow, a sky covered in clouds–whatever, it’s awful. I’ve been sleeping an average of one to two hours every evening, between 5pm and 9pm (I work 8am-4pm). I then sleep a full seven hours. It’s a particularly odd situation for me since I spent the last fifteen years being unable to sleep well at all. I’m pretty sure it’s a mild case of season affective disorder. I’m not really depressed–no more than anyone is during weather like this–but I am exhausted all the time. OK…just had to vent for a second. Rotor Magazine has posted an article on their website about the 1955 Disney short film “Men Against the Arctic.” My grandfather, Captain Hank Cassani (ret. ), helped fly the helicopters used in the filming of the short. It went on to win an Oscar for Best Short Subject Story in 1956. But the story behind the scenes is just as interesting, featuring a helicopter being forced to land in Arctic waters and a run-in with a polar bear. You can read the article here (PDF). In the photo, my grandfather is standing third from right. Roy Scheider, the actor who spoke the immortal line in JAWS that gave this website its name, passed away yesterday. He was 75. In the last act of JAWS, Scheider’s character, Chief Martin Brody, is ladling chum out of the back of a boat when the giant shark pops his head out of the water for the first time. A shocked Brody backs all the way into the cabin, where he turns to Captain Quint and says, “We’re gonna need a bigger boat.” The line was an ad-lib by Scheider and was #35 on the American Film Institute’s list of 100 Years…100 Movie Quotes. Scheider had many other memorable performances in other movies, such as The French Connection. But for me, he will always be Chief Brody. Rest in peace, Chief.